The National Lawyers Gu ild (NLG), the oldest and largest human rights bar association in the United States, by its International Committee, its Indigenous Peoples’ Rights Committee and its Environmental Human Rights Committee, as well as the NLG’s Environmental Justice Committee, stands in solidarity with the sovereign Oceti Sakowin Oyate (the Great Sioux Nation), the Standing Rock Sioux Tribe, and its people in their just opposition to the construction of the Dakota Access Pipeline across their sacred and ancestral lands. The United States has failed to respect the national sovereignty and interests of the Tribe and its people, has failed to respect the nation-to-nation relationship with the Tribe established by treaties, and has failed to properly consult with the Tribe to obtain its free, prior, and informed consent for the construction of the pipeline. We stand with the great many defenders and protectors of ancestral lands, water, and spiritual, historic, and cultural resources at the Camp of the Sacred Stones currently blocking construction of the pipeline across the Missouri River near the Tribe’s land and territory. We applaud the indigenous youth who ran 2,200 miles to Washington, DC, to deliver to the United States government a petition signed by 160,000 people in opposition to the pipeline’s construction. The 30-inch diameter, 1,172-mile pipeline is proposed by Dakota Access, LLC, to connect the Bakken oil fields in North Dakota across South Dakota and Iowa to other pipelines in Illinois for the transport of approximately 470,000 to 570,000 barrels of crude oil per day. It has been estimated that the Bakken oil reserves, the largest in the United States, hold in excess of 5 billion barrels of oil and are producing over a million barrels per day. In April of this year, researchers at the University of Michigan found that the Bakken field is emitting about 2 percent of the world’s ethane, about 250,000 tons per year into the air, directly affecting air quality across North America. These emissions, combined with combustion of Bakken oil, are major contributors to the Global Climate Crisis that threatens the well-being of our environment, future generations, and the Earth. The proposed pipeline route crosses ancestral lands of the Standing Rock Sioux Tribe and the Missouri River. The Missouri River is a major source of water for the Tribe. The ancestral lands and water are sacred to the Tribe and its people, and they possess a responsibility to Mother Earth and to future generations to protect these ancestral lands and water. Energy Transfer Partners, the Texas company behind the Dakota Access Pipeline, and its affiliated entities, have a long history of violations of environmental laws including pending lawsuits by the states of New Jersey, Vermont, Pennsylvania, and the Commonwealth of Puerto Rico and the City of Breau Bridge in Louisiana over MTBE contamination of groundwater, as well as citations for releases of hazardous materials from its pipelines and facilities in Ohio, Oklahoma, Louisiana, Missouri, Texas, Pennsylvania, and Hawaii. Pipelines leak and spill. In one year alone, there were over 300 pipeline breaks in North Dakota. Numerous pipeline spills of millions of gallons of oil and contaminants into the Missouri River and its tributaries have already occurred. In January, over 50,000 gallons of Bakken crude oil spilled into the Yellowstone River in Montana. Oil from the Bakken field is more volatile than other crudes. The conduct of the US government in its approval of the Pipeline proposal breaches the terms of the 1851 and 1868 Ft. Laramie Treaties between the Oceti Sakowin and the United States. The exercise of colonial power by the United States in approving the proposal further violates the collective human rights of the Standing Rock Sioux Tribe and its peoples including the rights to self-determination, national sovereignty, and free, prior, and informed consent as to those matters that may affect them, which are secured to all peoples by the Charter of the United Nations, Art. 73; the International Covenant on Civil and Political Rights, Art. 1, 3 (ICCPR); and specifically to indigenous peoples under the United Nation’s Declaration on the Rights of Indigenous Peoples, Art. 3, 4, 11, 18, 19, 27, 28, 32, 37, 40 (UN DRIP), and Convention 169 of the International Labor Organization (ILO), Art. 6; and other international instruments that the United States as signed and ratified or have become binding customary international law. By Art. VI, Clause 2, of the United States Constitution these have become part of the Supreme Law of the United States of America. The pipeline further violates not only the National Environmental Policy Act, the National Historic Preservation Act, but also the collective human rights of the Standing Rock Sioux Tribe and its people to their spiritual, historic, and cultural interests in their ancestral lands across which the pipeline is proposed to travel, rights which are secured to them by the afore-stated international instruments and law. The proposed pipeline violates the collective environmental human rights of the people of the Standing Rock Sioux Tribe to life, health, clean water, and a clean environment, treaty rights secured to them by the Ft. Laramie Treaties as well as by the Universal Declaration of Human Rights, Art. 3, 25; ICCPR, Art. 6; the UN DRIP, Art. 7, 24, 29; and the American Declaration of the Rights and Duties of Man, Art. 1. In a flagrant violation of environmental justice principles, the pipeline was redirected towards lands near the Standing Rock Sioux Tribe from its original route north of the drinking water intakes for Bismarck, ND, in part to avoid non-Native lands and communities. This act of racial discrimination placing the people of the Standing Rock Sioux Tribe at disparate risk of harm violated their collective human rights as secured by the UN Convention on the Elimination of All Forms of Racial Discrimination, and violated the Executive Order on Environmental Justice, EO 12898. On August 10, Dakota Access, LLC moved construction equipment to the proposed Missouri River crossing site adjacent to the Standing Rock Sioux Reservation. Members of the Tribe prevented the developers’ earthmovers from digging trenches for the pipeline. Several tribal members and supporters were arrested, including Tribal Chairman David Archambault. NLG attorneys have responded to help with their defense. On August 15, Dakota Access, LLC filed a SLAPP (strategic lawsuit against public participation) suit in federal court in Bismarck, ND against a number of individuals, including the Chairman of the Standing Rock Sioux Tribe. The suit is an attempt to silence their opposition and to get the pipeline constructed before a federal lawsuit filed by the Tribe in the District of Columbia can be decided on the adequacy of federal consultation with the Tribe. Dakota Access, LLC seeks an injunction against anyone interfering with construction of the pipeline and could add federal contempt charges to existing criminal charges for those who continue to resist construction. A decision on the preliminary injunction sought by Dakota Access, LLC in Bismarck is scheduled to be issued by September 9, 2016. Meanwhile, the encampment of protectors of the land and water and the spiritual and cultural resources of the Tribe, which started with 35 people, has grown to over hundreds, with tensions mounting. We call for the respect of the sovereign rights of the Standing Rock Sioux Tribe and its peoples, and for the immediate and permanent halt of the construction of the Dakota Access Pipeline. In light of the growing Climate Crisis, we further call for the Bakken oil to be left in the ground. Photo: Officers from the Morton County Sherriff’s Dept. 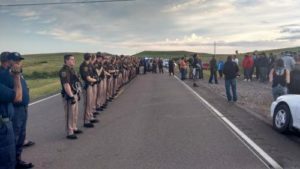 line up facing Dakota Access Pipeline protesters in North Dakota, August 15. Via Standing Rock Dakota Access Pipeline Opposition on Facebook. Posted in Announcements and tagged Environmental Justice.